Since 1865, Trinitarian Congregational Church has been a landmark in North Andover. Its 145 foot steeple can be seen towering over the treetops as one travels south down Route 495. Originally part of Andover, North Andover was created when a dispute over location of church sites came before the General Court in 1709 and the North Parish and South Parish were established. The growth of the two different communities of interest led finally to the separation of the two parishes on April 7, 1855, into two distinct townships, Andover and North Andover. The original Trinitarian congregation formed in 1834 after breaking away from North Parish due to dissatisfaction over the increasing Unitarian theology practiced at that church. They felt that Unitarianism did not espouse traditional Christianity that had been their heritage of faith. Ministerial leadership for the newly formed congregation was abundantly provided by students and faculty of the nearby Andover Seminary (the oldest Protestant graduate school of theology in this country), located at that time on the campus of the Phillips Academy in Andover. Many of the seminarians who walked across the fields in those years to superintend and to teach in the Sabbath School went on to become well-known religious leaders, leaving the tradition of a strong tie between Trinitarian Church and Andover Seminary (now the Andover Newton Theological School). The original meeting house was built near the site of the North Parish church. However, the congregation soon outgrew that building and decided to build another. Since a great amount of the support for the newly formed congregation was, by that time, derived from the owners of the Machine Shop, and since many of its members resided in the newer part of the town in which it was located, the decision was to locate the new building there. The original part of the church was erected in 1865-66 at the center of what came to be known as “The Machine Shop Village” (listed recently on the National Register of Historic Sites). 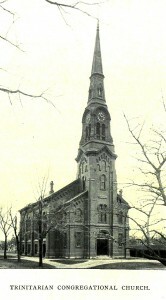 The building was constructed at a cost of $25,000, four-fifths of which was subscribed by three owners of the “shop.” Architect for the building was the highly reputed John Stevens of Boston, who designed a number of the imposing wooden churches of New England, including the South Church in Andover (1861). By 1885, an estimated 60 percent of the town’s population either attended the Trinitarian Church (known unofficially as “the Brown Church” by reason of the brown paint which covered its exterior until the mid-twentieth century), or held family pews in it. In 1896 the town held its 250th anniversary; Trinitarian Church was the site of the town’s all-day festivities. When the town celebrated its 300th anniversary in 1996, Trinitarian was again at the center of the festivities. The church’s close relation to the Davis and Furber Machine Company continued throughout the first half of the twentieth century, as did also the company’s annual contribution of $1,000, begun in 1897. By the 1950’s, however, that relationship became more historical than contemporary as the church came to be comprised more largely of persons with none of the earlier Machine Shop associations. Trinitarian Church has the tradition of a very strong musical emphasis. In 1988, the church installed a 24-stop tracker organ, rebuilt by the Andover Organ Company and designed by Bradley Rule, who was then the organist of the church. At approximately the same time, the church acquired a 3-octave set of handbells. Over the years, Trinitarian has opened its doors to all who seek a safe, welcoming environment in which to worship, reflect, and engage in active Christian discipleship. Through food drives, hands-on outreach at local community meal programs and shelters, personal involvement in the ministry of “Communities Together” in Lawrence, as well as the annual youth mission trips, TCC continually strives to share God’s love in tangible ways within our community and beyond. Trinitarian Congregational Church is truly a place for spiritual growth, Christian fellowship and outreach, a special place where the human spirit can feel the touch of our Creator. 1645 First Congregational Church was organized in North Andover Center. 1834 Thirty-one members of “Trinitarian” persuasion separated to form the Evangelical Church; a meeting house was built on the east side of the North Parish Meeting House. 1835 The name of the church was changed to Trinitarian Congregational Church. 1865 Jan. 19, 1865 Congregational vote to build a new church in Machine Shop Village, the new center of town. 1865/66 Land for the new site of “The Brown Church” was given by the Davis & Furber Machine Company, who also provided for a large portion of the costs of the building. Entries in the treasurer’s book for 1865-66 include: Abbott & Clement Company (for the building), $22,506; bell, cast by N. Hooper Company of Boston, $819.34; Howard Clock Company, $534.00; furnaces & stove, $470.41; carpets – $1,000.00. Choice pews rented for $10.00. Deacon Davis presented the parsonage as a gift. 1905 Rev. John L. Keedy was called to the church. Some 450 members were added during his 18 years. 1923 Rev. Clinton W. Carvell began his 43 yr. ministry. 1927 Addition was built and central heating was installed. 1968 Rev. Herbert F. Schumm began his 28 yr. ministry. 1985 The Steinway Grand Piano is given by Sarah M. Field in memory of her family. 1988 The Tracker Organ was installed by the Andover Organ Co.
2018 The congregation called Rev. Debra Adams to be the 14th pastor of the church. Stan Boothby, Tim Seibert, Rev. Richard Knight, and Dorothy Taylor.